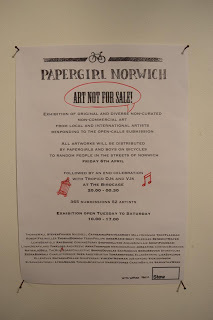 The Papergirl Norwich Exhibition now on at The Stew Gallery, 40 Fishergate, Norwich, Norfolk, NR3 1SL. I’ve got some photographs in the exhibition which runs until 1st of April. This is part of a Papergirl event so the artwork is going to be handed out to members of the public for free. The distributers of the artwork will all be travelling on bikes and this should happen the week after the exhibition closes.